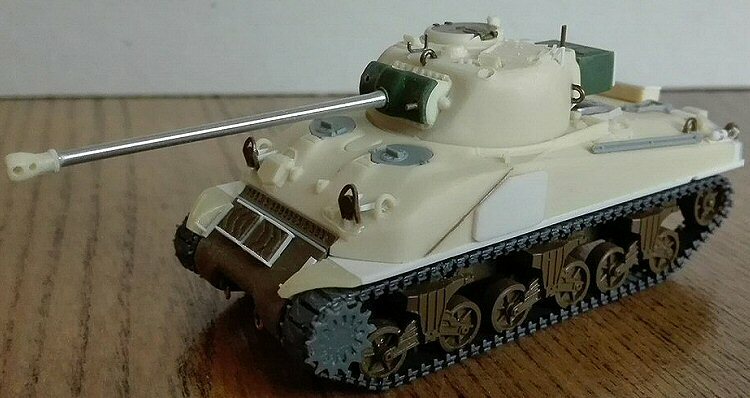 To field as many 17pdr armed Fireflies as possible, the British also used the M4 “Composite hull” (which they called “hybrid”) in addition to the Sherman Mk I and Mk V. At the time of writing, the M4 Composite hull/Sherman Mk I Hybrid is not available as a 1/72 plastic kit. There are two options to get one: the first is joining a cast hull front from a M4A1 76mm to a M4 kit. The second is using a resin conversion set. I was considering the first one when a friend donated me the MR Modellbau conversion kit. The set is designed for the Italeri M4A1 kit. This seems to be a strange choice to me, because there are better kits to use as a starting point. In theory, every M4 and M4A1 has the correct lower hull. 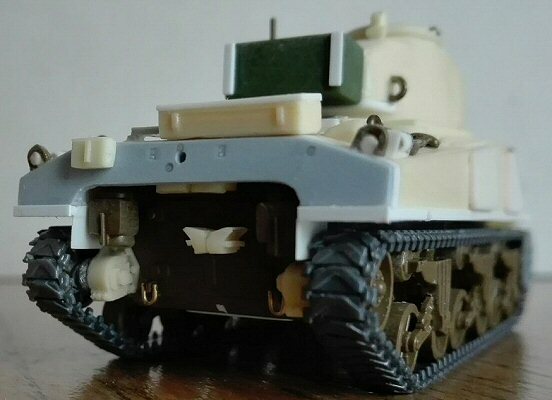 However, always better to check the details: this particular Italeri kit has the correct belly maintenance plates for a M4A2 or a M10. The resin set is composed by an upper hull with a turret, a set of 14 open spoke wheels, a pointed cast transmission cover and smaller resin pieces such as bins, smoke dischargers, fenders, exhausts, air filters, grouser storing cover, a telephone box, muzzle brake, turret bin and the new idler supports. In my kit, the mantlet was the standard M34A1 one and not the Firefly version. I’ve checked the photo of that item on the MR Modellbau site and found the mantlet to be correct, so I think my problem was due to a packaging mistake. Other little parts are made in metal: sprockets, hull hatches, air intake cover, idler pins and the track tensioner tool. There are also some surplus parts: a US type all around vision cupola hatch, a US type loader oval hatch, a MG support and two little items. Unfortunately, some pieces were also missing: the gun cleaning rods, spring towing device and its hook, a fire extinguisher and a resin piece which is listed as “25 - stowage and gear” but not shown in the instructions. The details look well done. The hull cast front is well depicted, better than another conversion set I’ve seen. Chrysler: rear towing hook absent, sprockets wheels with spokes, notched sandshields supports, right forward appliqué armour with clipped corner. ALCO: rear towing hook present, sprockets wheels without spokes, notch less sandshields supports, right forward appliqué armour with rounded corner. Both versions were randomly mixed in the batches T261894 - T263893 and T269094 - T271093, although in my photos, I have seen Hybrids only with 263xxx and 269xxx numbers. The tank proposed in the conversion kit is a Chrysler. The resin hull doesn’t have the sand skirts support strips. Although at first glance, the resin parts look well made with crisp small details, a closer observation revealed air bubbles, resin excrescence and two serious errors: the hull dimensions and the turret layout and alignment. 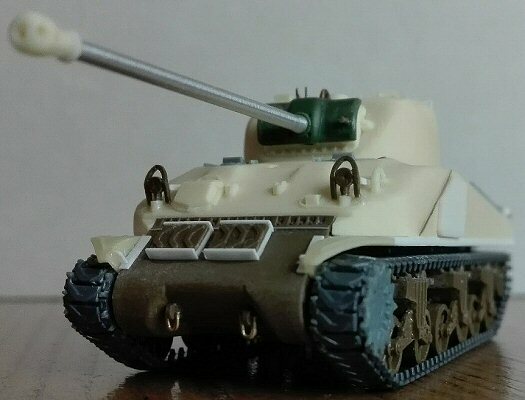 As usual, I wanted to depict a Normandy campaign tank. I used the Hunnicut book and this very good website http://the.shadock.free.fr/sherman_minutia/index.html. The turret depicts a high bustle turret, so it has the pistol port (correct), but it doesn’t have the cast-in armour (not correct). This turret type was effectively used for the Firefly but, having already its own loader hatch, as far as I know, this was retained without modification (see photo #1). 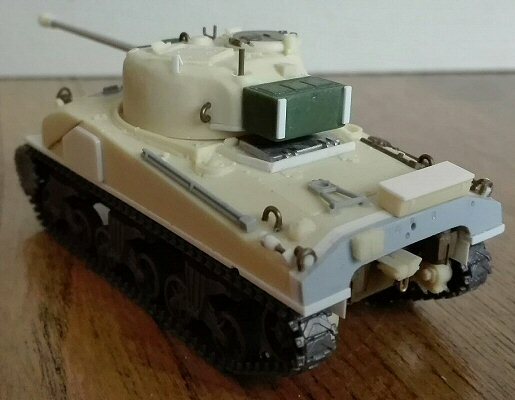 If the kit turret is used as a high bustle type, the hatch must be changed and the lower bustle edge needs to be rounded (the turret one, not the radio box). If the turret is converted in a low bustle type, the hatch has to be retained. Luckily I had a spare radio box, so I could convert the turret in a low bustle type because the photo of the tank I’m trying to depict had it. I say “luckily” because I had however to remove the radio box and rework the turret, because my resin turret was cast obliquely oval. 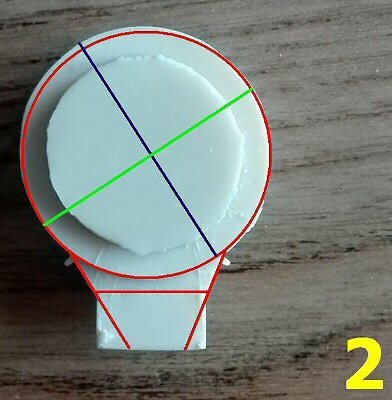 In photo #2 I show a red circle to enhance the general oval form; just check the longest diameter the blue line) against the shorter one (the green line). The bustle also resulted asymmetrical. Furthermore the forward half of my turret had bulging sides, not vertical ones (see photo #3). Anyway this could be a “una tantum” problem not shared by every turret cast by MR Modellbau. A careful filling and filing job was needed to restore the rounded shape, to get the left forward side vertical and to shape the cast-in armour on the right forward side. The interlock, which goes in the upper hull hole, was also made more round, adding plastic where needed. I removed the pistol port. I removed the radio box and then I reshaped the bustle adding plastic on the bottom. I replaced the lifting points with metallic wire. The cast on gun mount is the late M34A1 type without the lateral flange and needed a bit working of the sides, which weren’t parallel when seen from above. 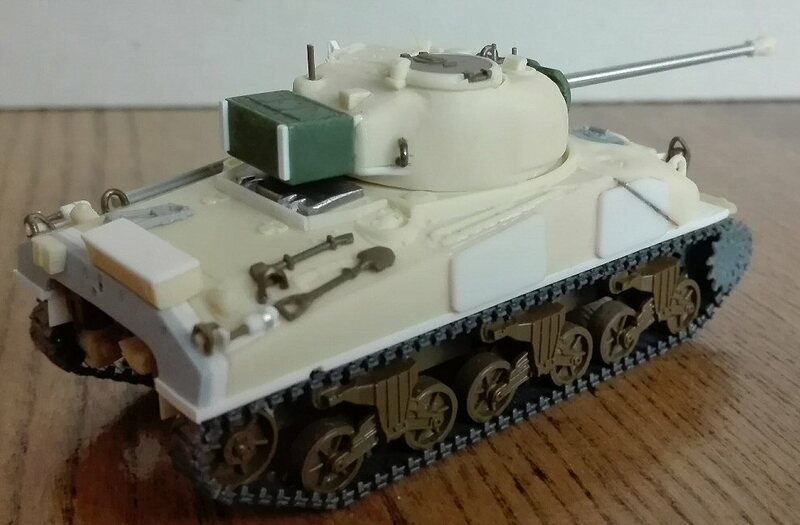 Due the packaging mistake mentioned above, I had to replace the standard M43A1 mantlet supplied by MR. Luckily I had a UM spare part, so I used it as a replacement. Since I removed to the original radio box to change the bustle layout, I added a UM radio box from my spare box. The loader hatch received its stop made by thin plastic sheet. The squared bracket behind the hatch (removed during the bustle reshaping) was made in plastic. The aiming device was made with a shaped staple. 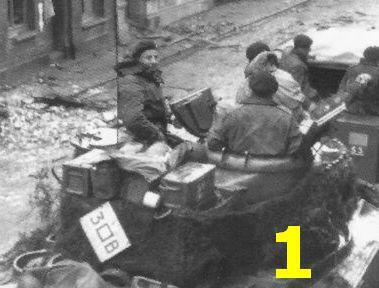 The turret bin (34) was sometimes attached to the radio bustle. This gave a strange stretched silhouette to the turret (in my opinion). I didn’t use it, anyway if used it should be shimmed because, being correct in height and width, it is a couple of millimetres short in depth. I added an interlock made by plastic sprue to the turret to avoid it accidental falling out of the hull. Comparing the hull with both photos and drawings revealed the upper hull being too short in length and height. 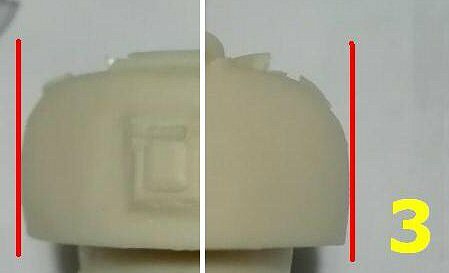 The length shortage is in the engine compartment and is made very visible by the two oval holes which are almost attached to the rear plate, a simple comparison shows this isn’t correct (see photo # 4 with a Heller hull). I lengthened the hull shimming the rear plate by 1.5 mm plastic sheet. Shaping the shim in place, I realize how much the welding seams are stepped (they were more flush). Carefully I had to smooth the welding seams by a cutter and sanding paper. I glued a spare rear plate from the Heller M4 kit (but any other plastic piece would be the same) obtaining the extra 2.5 mm needed. Two interlocks were filed for the turret. The rear lifting points, filed away during the sanding job, were replaced by metallic wire. The telephone box is a bit too tall. I lowered it before gluing in place. The appliqué armours are well done, but unfortunately I had to them file away because the hull sides were not parallel and straight. The sides were slightly curved inside. The difference was perceptible for the naked eye. After having flattened the sides the hull resulted slightly slimmer, but still within my tolerance range. The transmission cover had some resin excrescences (due to some cracks in the mould I suppose). To use it I’d re-sculpt the details. I choose to keep the Italeri one, adding the cast-in bullet splash and modifying the towing points. The bolt heads strip was cut off from the Italeri upper hull and glued to the resin upper hull. The upper hull is missing the sand shield support strip height. This is visible also on the lower edge of the cast front. The forward corners cut look small when compared to photos of the original tanks, with the fixed fenders placed a bit too high. I filed off the fenders and I restored the hull edge. I replaced the welding seam lines between the cast front and the welded hull by gluing and sanding down some stretched sprue. I glued a large piece of 1.0 mm plastic sheet with a cut at the rear. This restored the more correct dimensions, the sand shields strips and the fixed fenders. Having corrected the upper hull to attach it to the Italeri hull the way shown on the instruction didn’t work, so I chose another method. The lower hull sponson floors were removed cutting horizontally the wall and the two hull halves now joined well. During this modify the ejector pin marks were filled and sanded. The engine deck hinges and bullet splash guards are not symmetrical. While I kept the hinges as they are, I replaced the bullet splash with thin plastic strips. The crew hatches are made in metal. They are not bad, but having a couple of better Dragon ones from the spare box I preferred to use these. The air inlet cover is a metal part. Mine had a hole due to a casting problem, I filled it. During sanding, I realized the piece also needed some shape adjustments. 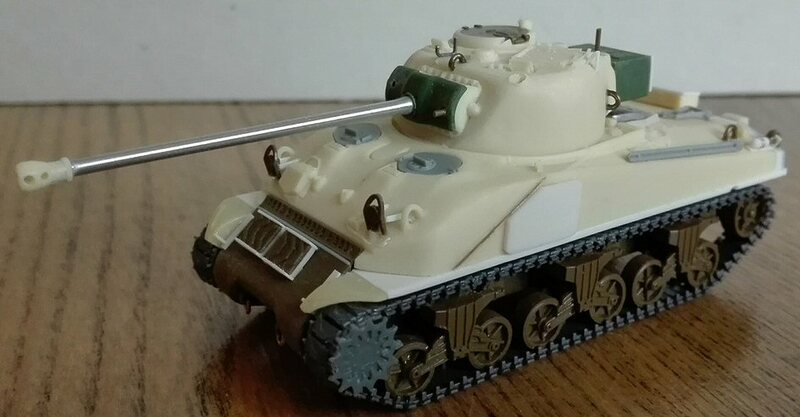 The Firefly travel gun lock placed on the engine deck was also used on the hybrids, but some retained the original one so is important check the original tank one wants to depict. For mine I used a Dragon spare one being the kit one missing (anyway in the MR one doesn’t look well in the photo on the maker site). Based on the photos consulted the trapezoidal stowage bin (for greatcoats according to the technical drawings) was seldom used so I left it in the spare box. The missing gun cleaning rods set was replaced by a Dragon spare part. I added the four shackles made by metallic wire. I added to the transmission cover the two track links racks myself by using six Italeri spare links and plastic sheet. Apparently there were two layouts: horizontal just below the bullet splash lip (sometime symmetrically, sometime shifted to the right) or vertical at the centre. Often forgotten details are the fire extinguishers. I scratchbuilt a couple with their housings (not so hard to do) and then they were placed on the engine deck rear corners. The horn and its brush guard were removed on most of the photos I’ve seen, but its presence is confirmed on some. The tank I'd made didn’t have it so I left it on the sprue. The engine deck rectangular bin looks a bit short and wider when compared to the photos I have, so I filed the sides to make it 13 mm wide (I scaled it from a photo so it could be not exactly correct, but checking with the crank hole now it look better) and I added a new cover with plastic sheet. 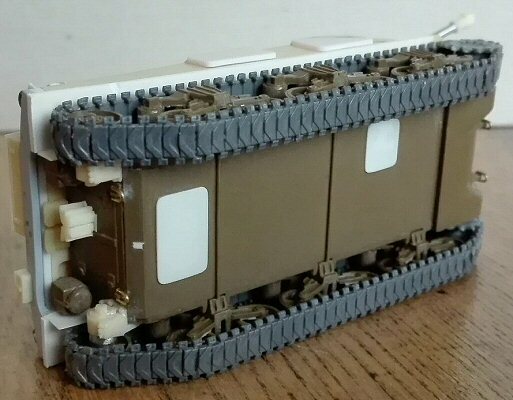 The maintenance belly plates layout was changed by thin plastic sheet. The two transversal rods were replaced by stretched sprue. The MR air filters are as good as the Italeri ones. I kept them giving a more correct position. This time I tried to correct the bogeys height. After having assembled them with the wheels well glued on, I carefully cut off the arms with the wheels by a thin sharp blade. I filed off 1.0 mm from the bogeys bottom and then I glued the bogeys to the hull. For a better alignment I glued the arms in place at the end. The look I'd achieve seems more correct in my opinion. My hybrid being a Chrysler tank, I filled the interlock for the towing hook by a plastic chip. The idlers supports look quite well. The metal pins anyway didn’t fit well, so I glued them to the idlers on the centred pin side and filed away the others. The smoke generators are well done and need only to be shimmed for a better gluing to the hull. The MR wheels are the open spokes type. They are quite well done, although the holes between the spokes are filled (too deep to depict the closed welded spokes). I used the Italeri pressed wheels, they aren’t perfect, but they are the type usually used on the M4 composite/Sherman hybrid seen in Europe. The MR sprockets are correct for a Chrysler tank, but both had an irregular sink mark in the centre. Having a couple of sprockets from an Extratech kit, I used these. The Italeri tracks are the rubber T48 type. I think they are quite well done (better than others for sure). Being widely used on the Chrysler hybrid Fireflies I used them. Luckily I had some spare links because at the end I needed four extra links due to the altered layout of the set. On the subject of the tracks as far as I can tell, most of the Firefly hybrids photos I’ve seen show them with the T48. To choose an aftermarket option I have to say that the remaining few had the T54E1 type (and two tanks had a T54E1 track on a side and a T62 track on the other!). I have two opinions about this kit: the first is about the MR Modellbau kit MR-72022 in general, the second is about this specific MR Modellbau kit I'd got. First the kit in general: although the hull and turret small details are very good, these are obscured by the way the hull rear is cut short. Additionally, I don’t think the turret layout existed unless a photographic evidence shows up. Other peculiar pieces need to be corrected or replaced, such as the NWE turret bin. 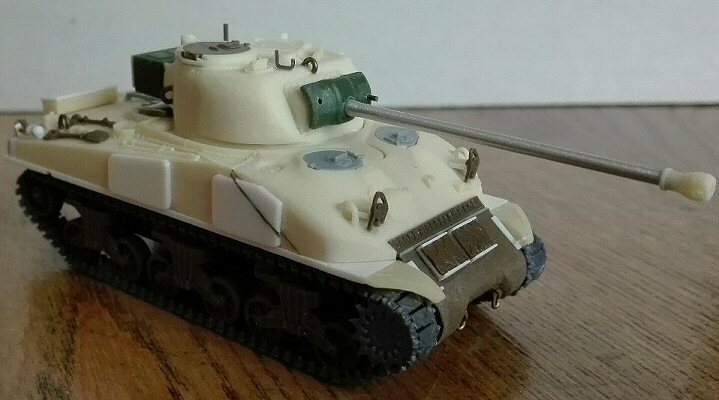 I suppose MR Modellbau still suggests the Italeri M4A1 as the base for this conversion because it was the only choice available when the set was released. However, the newer M4 or M4A1 (Dragon or Heller) available today would be a better base if MR would adapt their instructions. Additionally, MR wouldn't have to provide a number of pieces already present in those plastic kits (such as the wheel set and the transmission cover) and the modeller shouldn't have to adapt the Italeri hull. On the subject of my particular kit: the deformation of both turret and hull sides, the wrong pieces and the missing ones... I’d like to think this is due to a single unlucky packaging problem. Anyway this conversion set is not cheap and I think is a must to find in the box what is advertised. From both perspectives my opinion couldn’t be positive. Thanks to Gianluca Trivero for donating this kit.